Canine rheumatoid arthritis is a fairly rare yet painful condition suffered by some pets. Learn more about this chronic condition, how to spot it and what a vet can do to help an affected canine. Canine rheumatoid arthritis (CRA) is a chronic condition that causes joint pain and eventual deformity. It's mainly caused when the immune system misidentifies some of the body's own protein as foreign matter. The immune system then produces antibodies known as rheumatoid factors that bind with the misidentified protein to create immune complexes. These complexes build up in the joints and cause the classic inflammation associated with arthritis. There also seems to be a connection with the distemper virus in some cases. Traces of that virus have been found in the joints of some affected animals. Rheumatoid factor antibodies can also attack these traces of virus and cause damage to the joint tissue and adjoining bones. CRA is often referred to as rheumatism although this term encompasses other types of non-immune-related arthritis such as osteoarthritis and septic arthritis. CRA is actually much less common than osteoarthritis in dogs. It primarily affects small and toy dogs and can also be found in cats and humans. There are a number of symptoms produced by canine rheumatoid arthritis. These symptoms can appear in almost any combination, and they also seem to come and go. A dog is usually affected in more than one joint, and the pain and stiffness may actually appear to switch from one side to another, depending on where the rheumatoid factors happen to be the most concentrated on any given day. Diagnosing a case of rheumatoid arthritis can be difficult. Veterinarians can look for rheumatoid factors in blood samples, but the factors are not always present if the dog isn't currently having a flare up. Vets depend more on a physical examination to help them diagnose a case, and this includes close examination of the leg joints to check for pain, heat, and swelling. Vets can also examine synovial fluid samples from the joints to check for cloudiness and a thinner than normal consistency, both of which can indicate CRA. A canine rheumatoid factor test is an immunologic test performed by a veterinary lab to detect the presence of the rheumatoid antiglobulin factor in your dog's blood. The treatment plan for CRA varies from one dog to the next, and it can take a number of adjustments to find a course of treatment that provides the most relief. You should always consult with your veterinarian to create the best course of action for your dog's health. According to the Merck Veterinary Manual, corticosteroids can be used to reduce inflammation. Research indicates that cyclosporine may also be effective for dogs who cannot tolerate steroids. Pain medication is administered in many cases. Typical medications include NSAIDs such as Rimadyl, EtoGesic, Metacam and Previcox and analgesics such as tramadol. Immunosuppressants such as cyclophosphamide, azathioprine, or methotrexate may also be used, but they present additional challenges because secondary infections have an opportunity to take hold. Adequan injections can mitigate pain, reduce inflammation and help with joint mobility. Hydrotherapy can also be useful to increase a dog's mobility because it works the joints under weightless conditions. Gentle massage therapy may also be useful because it increases oxygen in the tissues. Acupuncture and chiropractic medicine can provide dogs with the same benefits as it does in humans with arthritis. Laser therapy is a noninvasive option that has become more popular for providing relief for dogs with arthritis. Regular exercise such as walking your dog is important for his health provided it's low intensity and adjusted for your dog's comfort level. You can also provide an orthopedic dog bed. The beds are made of high-density foam that offers more cushion than a conventional dog bed. Many are equipped with heat and massage features for added comfort. A bed like this lessens the stress on the joints and may actually make it easier for the dog to rise after resting. Dietary changes may also be in order if an affected dog is overweight. Reducing weight reduces the amount of stress on the joints. Glucosamine and chondroitin supplementation can also help boost cartilage production in deteriorated joint linings. Supplements can be added to your dog's daily meals such as Perna canaliculus (mussels) and turmeric. Methylsulfonylmethane (MSM) is also considered a useful supplement for improving a dog's joint functioning. Omega-3 fatty acids have anti-inflammatory benefits and can bolster a dog's immune system. If your dog is taking NSAIDs, discuss Omega-3 supplements with your doctor as there is a risk of the oils interfering with blood clotting. Gold injections have proven helpful in some cases. There is no cure for rheumatoid arthritis, so managing the symptoms is really the best that vets can do for an affected animal. 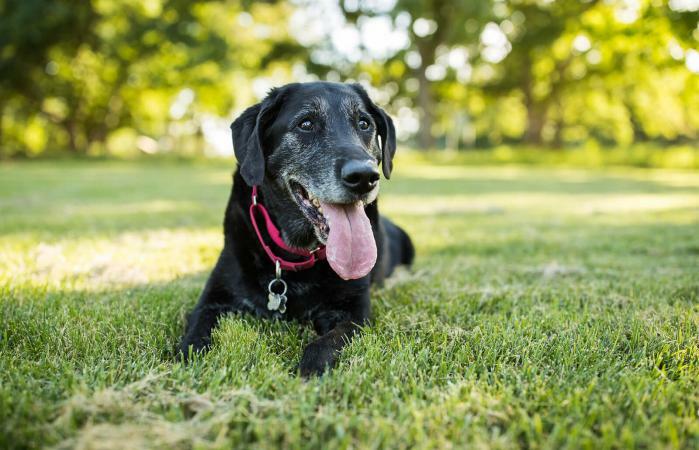 The average canine rheumatoid arthritis prognosis can be good with some adjustments in your dog's lifestyle, diet and treatment options. With proper care, patience and affection, a dog can live for years beyond the initial diagnosis.